Three films I've recently come across: this one is Argentine, with one Argentine and one German/Argentine to follow. Pascual Contursi's son, José María Contursi, was a prolific tango lyricist who wrote the song called Gricel. The lyrics and a translation are here, and this is probably the best-known version, Troilo with Fiorentino. It's a tortured song: the poet has seduced a woman, regrets it and can't forget her. According to his daughter and friends, Contursi always maintained that Gricel was a fictional character, and the story behind the song was imagined. But after his wife's death in the early 1960s Contursi asked his daughter's permission to bring someone into his house... and it was Gricel. The song quite definitely was not a fiction. 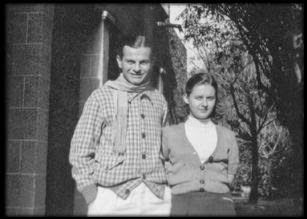 Contursi had met Gricel when he was in his mid-twenties and she was a beautiful 16-year old on a visit to Buenos Aires, around 1936. There is a photo of them from around this time. She returned home to the hills around Córdoba, and he returned to his wife, but they kept in touch, and he visited Córdoba a few times. Then in 1942 he sent her the song, Gricel. It's a sad outpouring of love and regret, and as he titled it with the name of the woman herself it was personal, and also a message. She married in 1949 and had a daughter, but her husband abandoned her. In 1962 Contursi's wife passed away, and in 1967 he and Gricel married. He died just five years later. The trailer for Gricel: un amor en tiempo de tango (2012: dir. Jorge Leandro Colás) is on YouTube, and it includes extracts from interviews with Contursi's daughter and with one of his friends. However, instead of being just a remarkable documentary of an era of tango history, the film uses a framing device: Pablo Basualdo, a lead singer with the Teatro Colon company, wants to make an opera around the story of Gricel, a story which might well have inspired a Puccini or a Busoni. The film follows him as he researches the story and interviews people who knew Contursi, and as he sings extracts of the opera. He's a great singer, but the music doesn't come from a tango background which I thought is a pity, as a tango opera on the story of Gricel could be a really interesting project. Perhaps the entire opera is in the full film: it's impossible to tell from the trailer. However, the cast list on IMDb shows that a lot of people talked to camera, so I hope the film is more documentary than opera, and I certainly look forward to seeing it. It doesn't appear to have a DVD release yet. Gricel herself passed away in 1994. 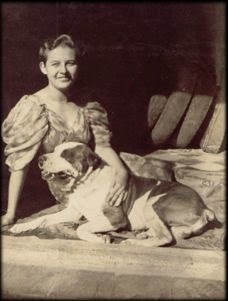 This must be a photo of her late in life, as it's said the dog survived her. Is Happy Tango still a useful book to own? The latest news! 'Madrigal de ausencia', la nota de Matías Gonzáles. © 2008-2016 All rights reserved. This blog may be linked to other blogs or websites but may not be reproduced, altered or copied without the author's written permission.